near the Palmetto Expressway (SR 826). Take the NW 74th St. exit and turn right onto 74th St (to go east). Turn left onto 72nd Ave/Milam Dairy Road. Turn right, back onto 74th St before the Burger King. (74th St. is divided by 72nd Ave). Turn left onto 69th Ave at the first stop light. Turn right onto 76th St and look on the right for address 6890. 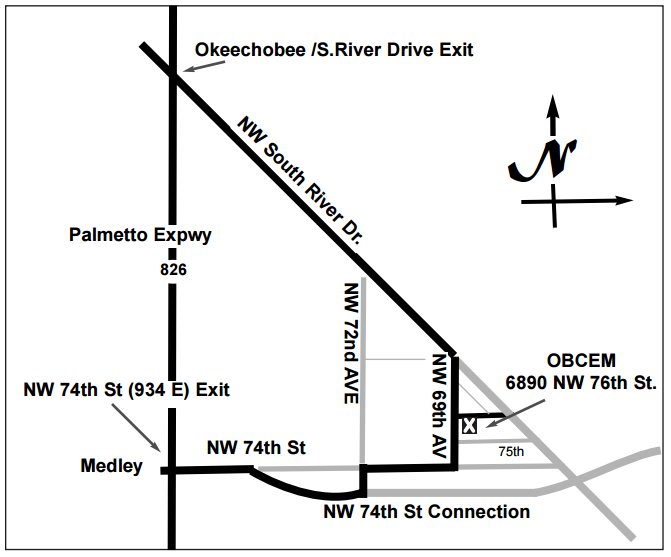 Take the NW 74th St. exit and turn left onto 74th St (to go east). If you have questions, call: OBCEM Warehouse 786-868-5012.